The newest member of Martha’s close-knit quilting circle has an eye for couture. But when the designer’s fingerprints are found blanketing a crime scene, Martha must prove that he didn’t have a hand in homicide! Martha Rose is alarmed by the discovery of Dolleen Doyle’s dead body, especially when evidence suggests a fellow quilter committed the crime. Set on clearing her pal, Martha searches for answers—but with ties to a convicted fraudster’s stolen millions and a secret office room, the victim’s past raises even more questions. As Martha inches towards the culprit, she learns that wrapping the case up—and living to baste another square—will be trickier than she ever imagined . . . I really like this series and have read them all so far. Martha Rose and her friends are at it again. When they find out Dollen has passed away Jazz is the one they are looking at. Looking into Dolly’s husband they discover deceit and criminal activity in addition to the Ponzi Scheme Dolly’s husband is serving time in prison for orchestrating. Can they find out what is going on? What about Crusher and Arlo? Will she stay with Crusher? A cute read. The author really knows how to write a story that will keep the reader glued to the book. You will not want to put this story down until the end and what an ending it is. I’m really curious about that ending. 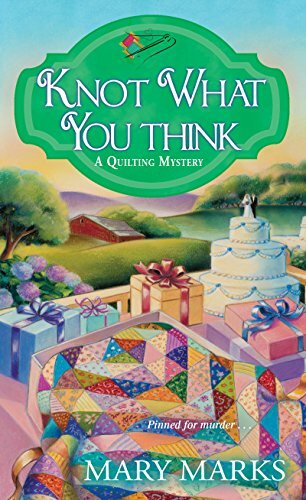 I’ve never read a quilting mystery before! This would be the first!